"Chasing The Waves," a photo exhibit to raise awareness of the effects of rising seas on our shores and communities, will be on display at Weedon Island Preserve's Cultural and Natural History Center through November 30. In conjunction with the exhibit, a special "Salty Topics" lecture will be presented on Thursday, November 7, from 6:30-8 p.m. by USF marine science professor Don Chambers. Dr. Chambers will address "Sea Level Rise: What We Know, What We Don't Know and What We Need To Know." The lecture is free, but online registration is required. Dr. Chambers specializes in using satellite observations to measure sea level change both globally and regionally. He has served on numerous national and international science committees, including as a lead author on the 5th Climate Assessment of the Intergovernmental Panel on Climate Change (IPCC), published in September 2013. Weedon Island Preserve is located at 1800 Weedon Drive NE, in St. Petersburg. The Tampa Bay and Sarasota Bay Estuary Programs have partnered to present "Chasing the Waves" as a way to visually depict how sea level rise may affect our shorelines, structures and communities. The exhibit features photos taken locally and around the world during annual "King," or extreme high tides. 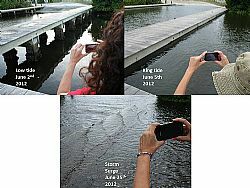 King Tides occur once or twice a year when the earth and moon align, producing the highest predictable tides. The exhibit is traveling to libraries, museums and other venues through May 2014. Join us on November 7 for light refreshments and viewing of the King Tide photo exhibit beginning at 6:30 p.m. followed by the Salty Topics lecture at 7 p.m.